Today marks the completion of what both Patriot and Protester, knowingly or not, are unified in referencing. What was signed as completed upon this day, two hundred and twenty-nine years ago, September 17th, 1787, by thirty-nine of the fifty-five Framers, was the Constitution of the United States of America, and whether you stand in respect for, or disrespectfully turn away from, the Flag, the National Anthem or the Pledge of Allegiance, you do so in reference to that document which is the oldest existing instrument of its kind, still in operation. Is it simply a list of rules for governing by? Is it nothing more than a favorite fossil of ‘white people‘? A document of oppression? Frederick Douglass once thought so, but because he was a thinker in order to understand what was true, he didn’t stop with answers that were given him by others, but continued on thinking upon the matter, and discovered the Truth which such vile falsehoods seek to smother and erase. But today I’m really not much concerned with your answers to those ‘points’, but am only interested in whether or not you are familiar with the ideas, principles and purposes which animated the writing of it – are you? And if not… what worth can your opinion – pro or con – have for me, or for anyone else? Whether you mouth its praises, or make showy protests against it, without understanding what it is you are referencing – your praises and protestations fail to even rise to the level of being wrong, they are but verbal dust to be brushed away, meaningless and of no consequence. But if you are one of that thoughtless many, you may take comfort in the knowledge that you are in the happy company of millions of such Pavlovian ‘Conservatives’, Pro-Regressive Leftists and Libertarians, for whom the United States Constitution is little more than a paper bell which they bark at. , and that for such a people, intellectually armed through a document such as this, Liberty is possible. But it is only possible for those who understand that. Whether you are ‘for or against it‘, especially on this day, in our day, you’d be wise to consider what would happen if we should lose the last vestiges of it, and those protections it uniquely extends to both sides. For those of you who already do, or who are at least willing to make the effort to, understand those ideas which animated the framing of this document, those of you who understand that such principles and ideas as these cannot be owned by any race or culture, but can only be discovered by some for the benefit of all, then by virtue of that understanding, you and I are unified through these thoughts which were so well formed, written down, and ‘completed’ (and not to forget the first debate on amending its completion), on ‘the Seventeenth Day of September in the Year of our Lord one thousand seven hundred and Eighty seven’. One final point, whether you are an old hand with, or relatively new to, this document and its ideas, I take it as an obvious point that your reading of it can be greatly improved and informed by those arguments for, and against it, that were in the minds of those who debated the writing and ratifying of it. One of the best tools I’ve ever found for considering and reflecting upon the whole or particular parts of the Constitution, is the University of Chicago’s site “The Founders Constitution“. Scroll down on the contents page and you’ll find that it goes through the Constitution clause by clause, and that each is supplied with a list of links to those relevant portions of not only the Federalist and Anti-Federalist Papers, but to documents which the Founders had in mind when writing the Constitution, to what the Anti-Federalists objected to (this is particularly helpful in understanding the arguments for the Constitution which the Federalist Papers make), as well as early Supreme Court opinions and judgments that were relevant to that clause being acted upon, as well as the commentaries by early Supreme Court Justice Joseph Story (which are fantastic). Every Bill which shall have passed the House of Representativesand the Senate, shall, before it become a Law, be presented to the President of the United States; If he approve he shall sign it, but if not he shall return it, with his Objections to that House in which it shall have originated, who shall enter the Objections at large on their Journal, and proceed to reconsider it. If after such Reconsideration two thirds of that House shall agree to pass the Bill, it shall be sent, together with the Objections, to the other House, by which it shall likewise be reconsidered, and if approved by two thirds of that House, it shall become a Law. But in all such Cases the Votes of both Houses shall be determined by yeas and Nays, and the Names of the Persons voting for and against the Bill shall be entered on the Journal of each House respectively. If any Bill shall not be returned by the President within ten days (Sundays excepted) after it shall have been presented to him, the Same shall be a Law, in like Manner as if he had signed it, unless the Congress by their Adjournment prevent its Return in which Case it shall not be a Law. To make all Laws which shall be necessary and properfor carrying into Execution the foregoing Powers, and all other Powers vested by this Constitution in the Government of the United States, or in any Department or Officer thereof. No Preference shall be given by any Regulation of Commerceor Revenue to the Ports of one State over those of another: nor shall Vessels bound to, or from, one State, be obliged to enter, clear, or pay Duties in another. Section 10. No State shall enter into any Treaty, Alliance, or Confederation; grant Letters of Marque and Reprisal; coin Money; emit Bills of Credit; make any Thing but gold and silver Coin a Tender in Payment of Debts; pass any Bill of Attainder, ex post facto Law, or Law impairingthe Obligation of Contracts, or grant any Title of Nobility. Section 3. He shall from time to time give to the Congress Information of the State of the Union, and recommend to their Consideration such Measures as he shall judge necessary and expedient; he may, on extraordinary Occasions, convene both Houses, or either of them, and inCase of Disagreement between them, with Respect to the Time of Adjournment, he may adjourn them to such Time as he shall think proper; he shall receive Ambassadors and other public Ministers; he shall take Care that the Laws be faithfully executed, and shall Commission all the Officers of the United States. Section 2. The judicial Power shall extend to all Cases, in Law and Equity, arising under this Constitution, the Laws of the United States, and Treaties made, or which shall be made, under their Authority;–to all Cases affecting Ambassadors, other public Ministers and Consuls;–to all Cases of admiralty and maritime Jurisdiction;–to Controversies to which the United States shall be a Party;–to Controversies between two or more States;–between a State and Citizens of another State;–between Citizens of different States,–between Citizens of the same State claiming Lands under Grants of different States, and between a State, or the Citizens thereof, and foreign States, Citizens or Subjects. Section 1. Full Faith and Credit shall be given in each State to the public Acts, Records, and judicial Proceedings of every other State. And the Congress may by general Laws prescribe the Manner in which such Acts, Records and Proceedings shall be proved, and the Effect thereof. The Congress, whenever two thirds of both Houses shall deem it necessary, shall propose Amendments to this Constitution, or, on the Application of the Legislatures of two thirds of the several States, shall call a Convention for proposing Amendments, which, in either Case, shall be valid to all Intents and Purposes, as Part of this Constitution, when ratified by the Legislatures of three fourths of the several States, or by Conventions in three fourths thereof, as the one or the other Mode of Ratification may be proposed by the Congress; Provided that no Amendment which may be made prior to the Year One thousand eight hundred and eight shall in any Manner affect the first and fourth Clauses in the Ninth Section of the first Article; and that no State, without its Consent, shall be deprived of it’s equal Suffrage in the Senate. 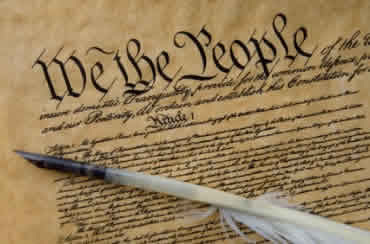 This Constitution, and the Laws of the United Stateswhich shall be made in Pursuance thereof; and all Treaties made, or which shall be made, under the Authority of the United States, shall be the supreme Law of the Land; and the Judges in every State shall be bound thereby, any Thing in the Constitution or Laws of any State to the Contrary notwithstanding. Congress of the United States; Begun and held at the City of New York, on Wednesday, the 4th of March, 1789. Article I – Congress shall make no law respecting an establishment of religion, or prohibiting the free exercise thereof; or abridging the freedom of speech, or of the press; or the right of the people peaceably to assemble, and to petition the Government for a redress of grievances. Article II – A well regulated Militia, being necessary to the security of a free State, the right of the people to keep and bear Arms, shall not be infringed. Article III – No Soldier shall, in time of peace be quartered in any house, without the consent of the Owner, nor in time of war, but in a manner to be prescribed by law. Article IV – The right of the people to be secure in their persons, houses, papers, and effects, against unreasonable searches and seizures, shall not be violated, and no Warrants shall issue, but upon probable cause, supported by Oath or affirmation, and particularly describing the place to be searched, and the persons or things to be seized. Article V – No person shall be held to answer for a capital, or otherwise infamous crime, unless on a presentment or indictment of a Grand Jury, except in cases arising in the land or naval forces, or in the Militia, when in actual service in time of War or public danger; nor shall any person be subject for the same offence to be twice put in jeopardy of life or limb; nor shall be compelled in any criminal case to be a witness against himself, nor be deprived of life, liberty, or property, without due process of law; nor shall private property be taken for public use, without just compensation. Article VI – In all criminal prosecutions, the accused shall enjoy the right to a speedy and public trial, by an impartial jury of the State and district wherein the crime shall have been committed, which district shall have been previously ascertained by law, and to be informed of the nature and cause of the accusation; to be confronted with the witnesses against him; to have compulsory process for obtaining witnesses in his favor, and to have the Assistance of Counsel for his defence. Article VII – In Suits at common law, where the value in controversy shall exceed twenty dollars, the right of trial by jury shall be preserved, and no fact tried by a jury, shall be otherwise re-examined in any Court of the United States, than according to the rules of the common law. Article VIII – Excessive bail shall not be required, nor excessive fines imposed, nor cruel and unusual punishments inflicted. Article IX – The enumeration in the Constitution, of certain rights, shall not be construed to deny or disparage others retained by the people. Article X – The powers not delegated to the United States by the Constitution, nor prohibited by it to the States, are reserved to the States respectively, or to the people. Background: In 1996 President Clinton signed the Personal Responsibility and Work Opportunity Act, which became popularly known as “welfare reform,” into law. The legislation transformed the Aid to Families with Dependent Children (AFDC) into Temporary Assistance for Needy Families (TANF), a program intended to provide temporary financial assistance to low-income families while encouraging work and self-sufficiency. Most significantly, the 1996 welfare reform included mandatory federal work requirements, stipulating that welfare recipients must be engaged in work or some type of work activity in order to receive TANF benefits. HOW Much Are the Reformers Making in Education? Look at These 990s….